Thank you for visiting the emPLANT website. Below you will find our policy for handling personal data. We encourage you to read it, as by visiting this site you accept the practices we have laid down and you agree to the terms and conditions indicated below. are protected by legislation concerning brands. The elements thus protected are the property of UniLaSalle or third parties having authorized UniLaSalle to use them. In-house documents from UniLasalle Beauvais, emPLANT Consortium or created by Idee Claire Communication for emPLANT website. Thus, any and all reproduction, representation, use, adaptation, modification, incorporation, translation, commercialization, whether partial or in whole, whatever the process and whatever the support (paper, digital, etc. 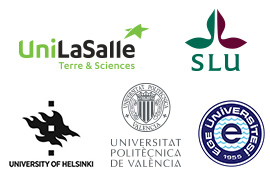 ), are hereby forbidden without prior written authorization from UniLaSalle, excluding the exceptions laid down in article L 122.5 of the French Code of Intellectual Property; doing so will constitute an infringement of copyright and/or legislation on designs and/or brands, punishable by two years of imprisonment and €150,000 in fines. The photographs, texts, slogans, drawings, images, animated sequences, with or without sound, as well as all creations integrated into the site are the property of UniLaSalle or third parties having authorized UniLaSalle to use them. Reproductions, whether on paper or computerized supports, of said site are authorized so long as they are strictly reserved to personal use excluding any and all use fort advertising and/or commercial and/or informational purposes and/or so long as they comply with the dispositions laid down in article L 122-5 of the French Cod of Intellectual Property Code. The information and illustrations found on the pages of this Internet site are based on the technical features commonly used at the time when the various pages of the site were posted on line or updated. Within the context of a policy of constant improvement of its products and services, emPLANT Consortium may modify the characteristics of its commercial offer at any time. They may vary from one country to another or may not be available in all countries around the world. In any case, the information contained on this site is information of a general nature and does not have contractual value. The emPLANT site may be viewed without your having to disclose your identity or any other information concerning your person. Information relating to individuals (personal data) is collected and used in accordance with the Regulation (EC) N° 45/2001 of the European Parliament and of the Council of 18.12.2000 on the protection of individuals with regard to the processing of personal data by the Community institutions and bodies and on the free movement of such data (OJ L8 of 12.1.2001, p. 1)1. We should point out that, in order to offer you products and services that are constantly adapted so as to better meet your needs, certain types of non-personal information concerning your activity on this site will be gathered automatically. This information is for emPLANT Consortium and may also be used in the context of commercial or marketing operations or may be used as a basis for studies and analyses. This information will not in any case be transmitted to third parties. Only the personnel at emPLANT Consortium or at agencies assisting us in managing such operations have access to data. These agencies are required to respect the confidentiality of information and to use it only for the precise operation for which they are called upon. We take all useful precautions to preserve the integrity of data, their confidentiality and to avoid any and all transmission to unauthorized third parties. Setting up a hypertext link to the www.emplant-master.eu site does not require prior written authorization from emPLANT Consortium. However, emPLANT Consortium must be informed of such actions within no more than 10 days following the link’s installation. In any case, emPLANT Consortium may in no way be held responsible for the content or the products and services offered on the sites to which the emPLANT master site is linked by hypertext links or any other type of link. Your use of the www.emplant-master.eu site is under your sole responsibility. emPLANT Consortium may not be held responsible for direct or indirect damages, notably such as property damage, loss of data or programs or financial harm resulting from the use of this site or the sites linked to it. The content of emPLANT website reflects only the author’s view so the Agency and the Commission are not responsible for any use that may be made of the information it contains. emPLANT Consortium reserves the right to modify and update the present Legal Notice, without prior notification, as well as any elements or products found on the site. All of these modifications apply to all web users, who should read these General Conditions at each connection. We use connection data for our browsing statistics (type of browser, number of visitors, pages visited, etc.) in order to optimize our site in terms of pages and browsing, but this information is not transmitted to third parties. respect of the integrity of the documents reproduced (no modifications, nor alterations of any kind). explicit reference to the www.emplant-master.eu site as the source and notice that reproduction rights are reserved and strictly limited. Reproduction of all or part of this site on electronic supports is authorized so long as the source (LaSalle Beauvais) and the notice “Rights Reserved” are added in a clear and legible manner. This information may only be used for personal or associative needs; any and all use for commercial purposes is strictly forbidden without prior written authorization from LaSalle Beauvais.